Villas Tel No. : Villa 84 can be reached by Phone or Fax. There are no outgoing calls other than islandwide local calls available. Get a prepaid Flow SIM card for your mobile at the supermarket! 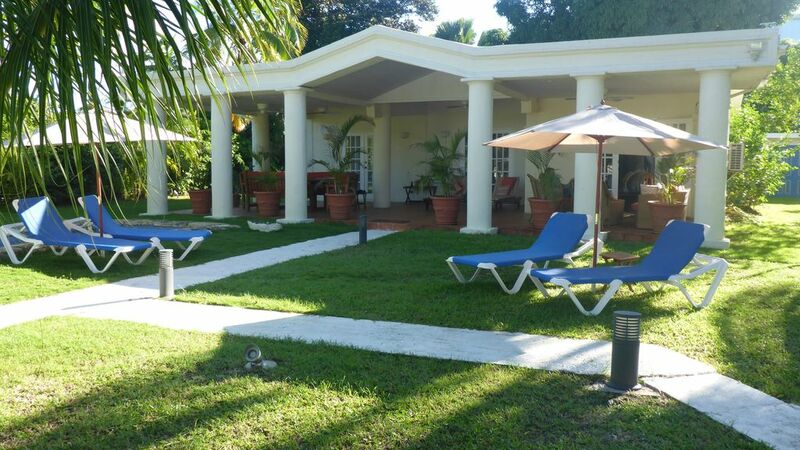 The Villa is used by us twice a year and offering a very comfortable atmosphere in a clean and well maintained manner. We are continuously improving and renovating every time we are locally present to ensure the works meet our german quality standards as well as the standards we want to live in comfortably. Last investment was inside and outside seating group, lowered wooden ceilings with ceiling fans and LED downlights, fast Internet broadband router and new washer/dryer. The complete garden lighting was replaced and improved. We wish all our past and future guests the same holiday experience we enjoy ourselves! Large Verandahs with multiple seating and relaxing opportunities and outside ceiling fans to escape from sun and rain. Dining tables in both locations. Large 40" flatscreen TV with numerous cable stations, chromecast access with fast Internet. We can also prearrange a variety of services such as airport transfers, restaurant reservations, sightseeing and sailing excursions, etc. Internet access for notebooks can be provided at a low as USD 30,- flat or different rates on hourly base. Two Internet cafés available within 300 yards. a outside shower is available on the rear veranda. Villa 84 is within the Sunset Crest Resort only 3 min walk to the Supermarket in Holetown/St James, 4 to 15 min to the most beautiful beaches in the area.